Many staff of the companies listed on this site have attended training courses or workshops on some aspects of responsible tourism. Below you will find a number of the most useful resources used in workshops and you are encouraged to download them for your own use. Recommendations about what to do, what not to do before, during and after the trip to be a responsible guide. A useful note to be read by visitors to Tibet before they arrive. An English language version of this responsible travel flyer is also available. A useful note to be read by visitors to Tibet before they arrive. A Chinese language version of this responsible travel flyer is also available. Social entrepreneurship can be defined as ‘making money with minimum negative impact on environment and positive impact on the people you work with.’ This presentation includes examples of when seemingly positive actions can have a negative effect. A presentation given to the Gannan Prefecture Tourism Bureau on the valley of conservation and ecotourism development. 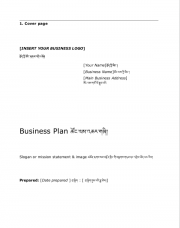 This Business Plan template is to be used with Create your own Business Plan presentation. The presentation and template are being used in Small Business Trainings in Tibet. This presentation gives an introduction into Marketing, including SWOT analysis and Marketing Mix. Used for Small Business training in Tibet. This is an introduction to branding used in Small Business Trainings in Tibet.